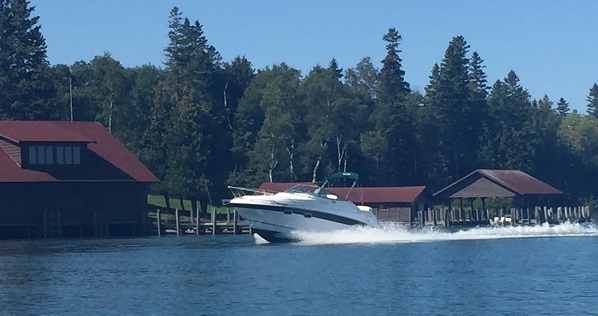 Left Merton Wisconsin at 3:55am and arrived at the St.Ignace Michigan launch on Lake Huron in six and a half hours. The launch was in great shape and cars with trailers may be parked over night. We prepaid $30 for four days. 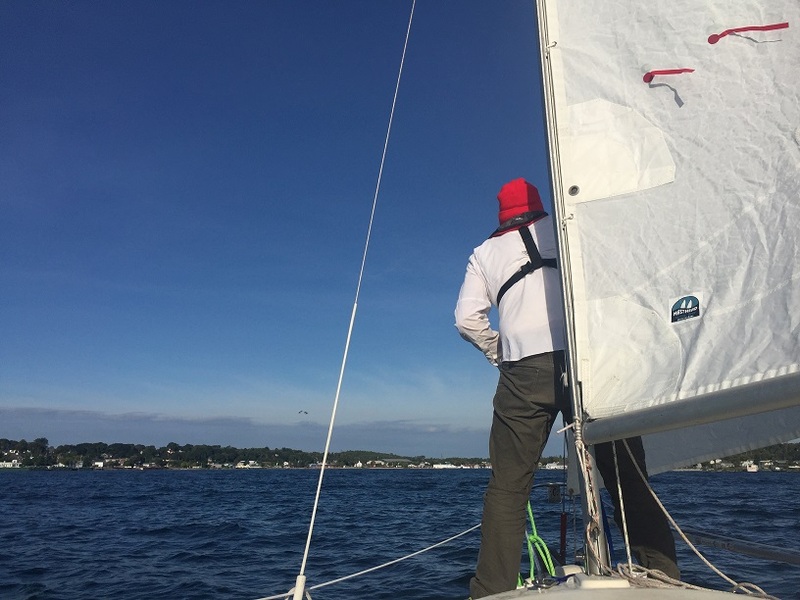 Started with a beautiful easy sail across the channel towards Mackinac Island, when in the middle of the channel the wind died. 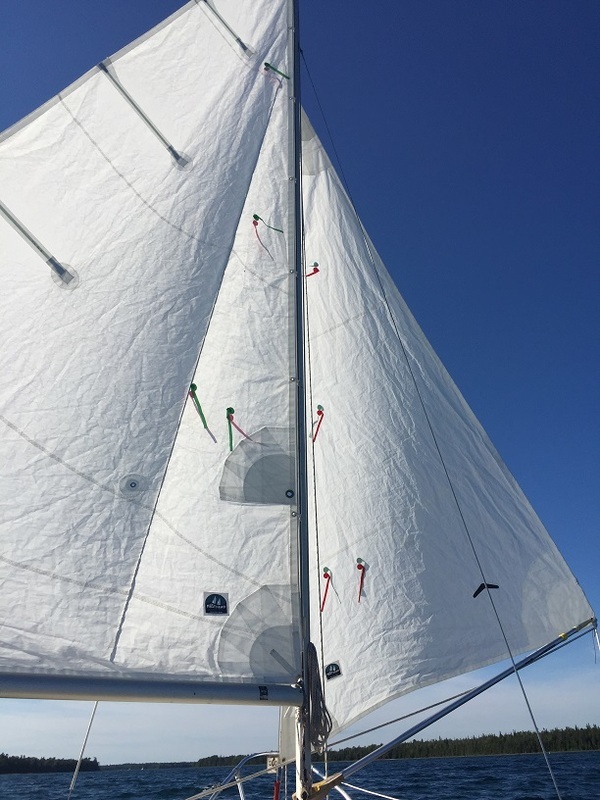 The weather on the trip was perfect, 50'sF at night and mid 70'sF mid day, with 5-10kt winds between the south and east. 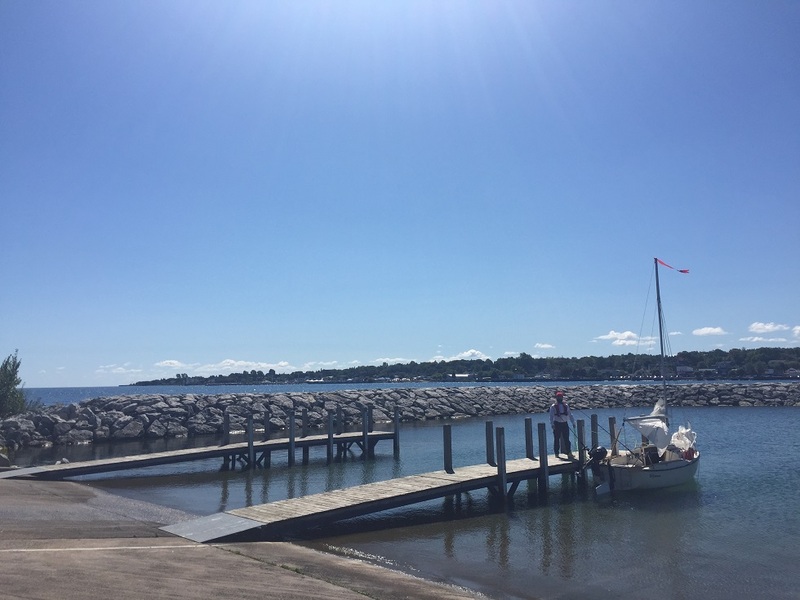 Mackinac Island is a fun and unique place to visit, featuring perfectly restored 1800s to early 1900s period architecture, older forts, fun restaurants and shops, and the whole is made better by the complete absence of any motorized vehicles. Ubiquitous horse carts and buggies carry people and goods around the island and bikes are everywhere. 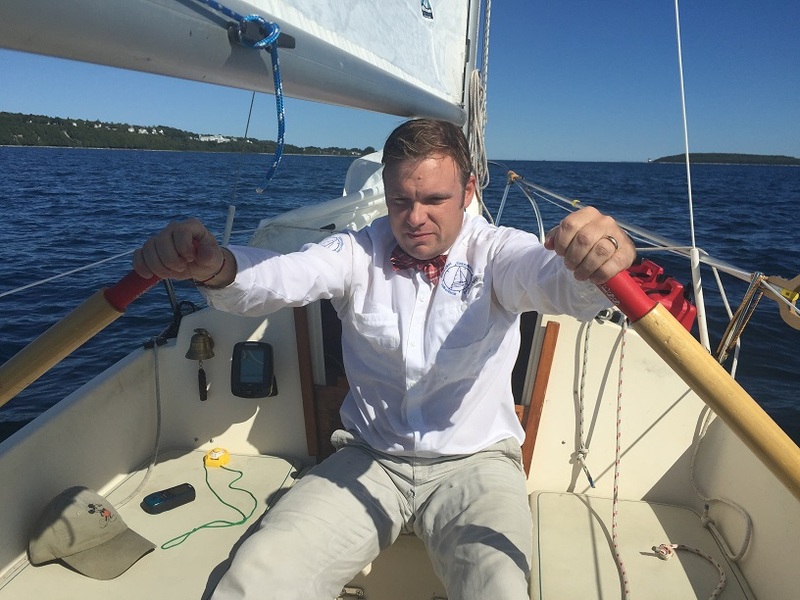 In light of the nature of our destination, we refused to use the motor and proceeded to row. 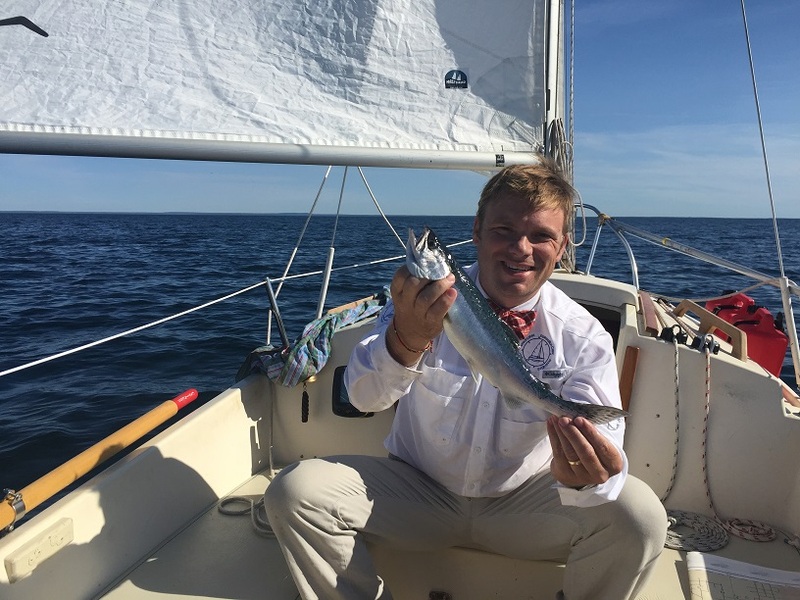 Our senses of humor and drive to make it to Mackinac without a motor motivated us to row our one ton (fully loaded with crew and provisions) craft, in our bow-ties for three hours till we came up to the dock on Mackinac Island. The dock charged $10 per person and $1 per foot; pricey, but we went for it. We walked around the town, and up to the famous old Grand Hotel, where we had two drinks and took in the view. 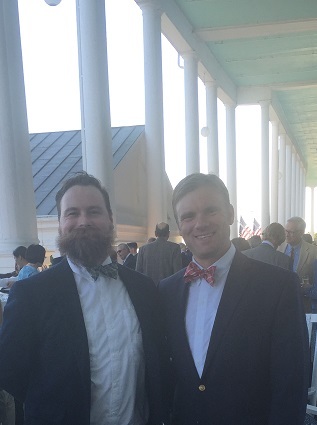 There is still a coat and tie dress code; luckily we were prepared. At the longest porch in the world at the Grand Hotel Mackinac. 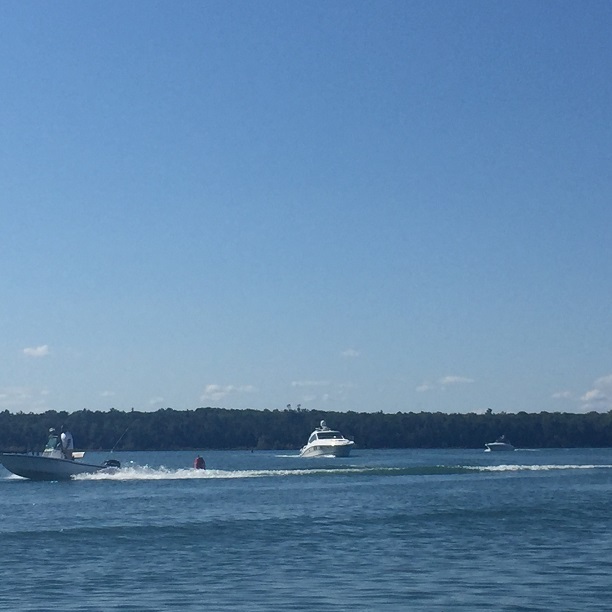 There are very frequent and very fast, large ferries coming and going into the Mackinac Island harbor. 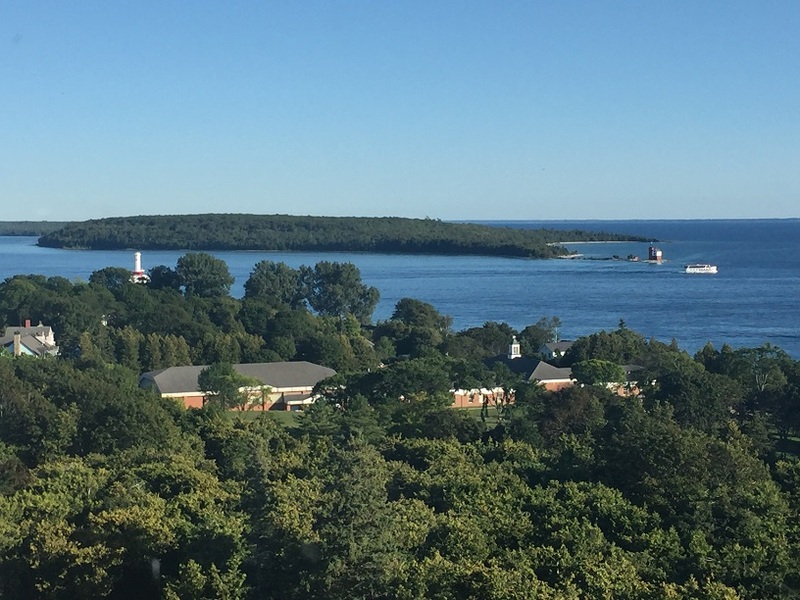 In addition there are frequent massive freighter ships passing through the small straight between Mackinac and Round Islands. 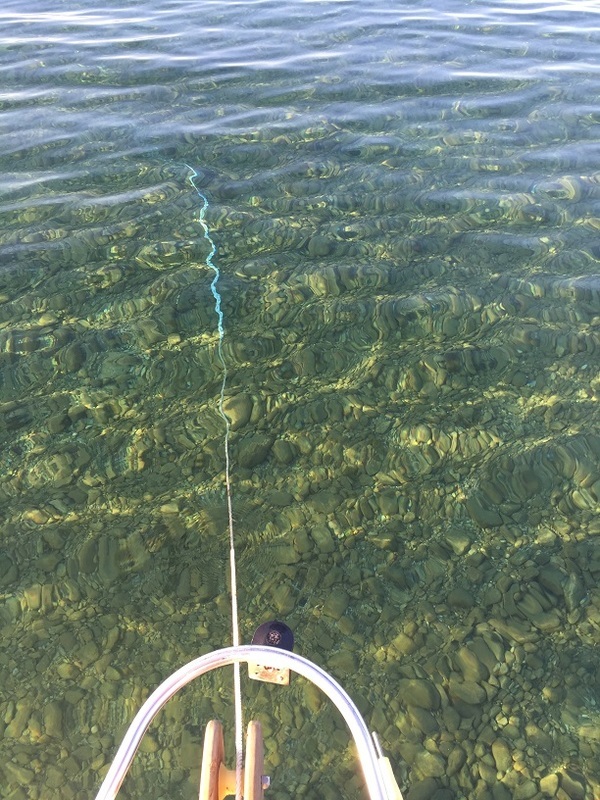 A small boat would be tossed around significantly if anchored in that area, so we decided to anchor on the southeast corner of Round Island, in the channel between Round Island and Bois Blanc Island. We found a pretty little spot and due to the shallow bottom which had many large rocks in it, there were very few boats, especially large ones. Be careful navigating here, not to run aground or strike a rock. 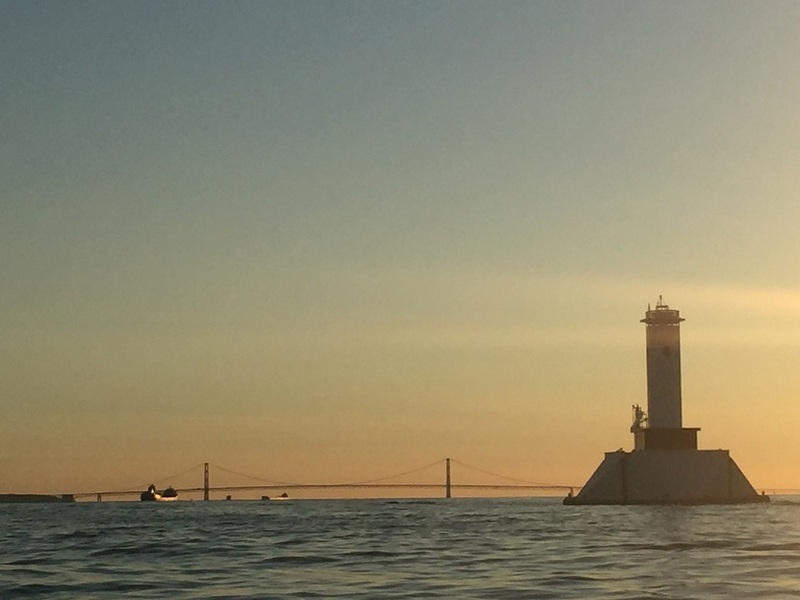 Channel Marker between Mackinac Island and Round Island, with Mackinaw Bridge in the background. 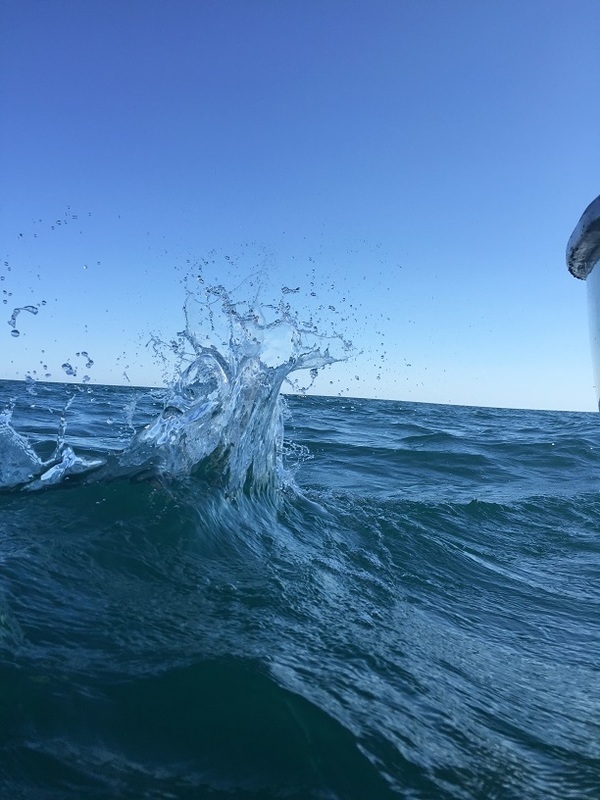 A freighter can be seen coming from Lake Michigan and another can be seen steaming into it. 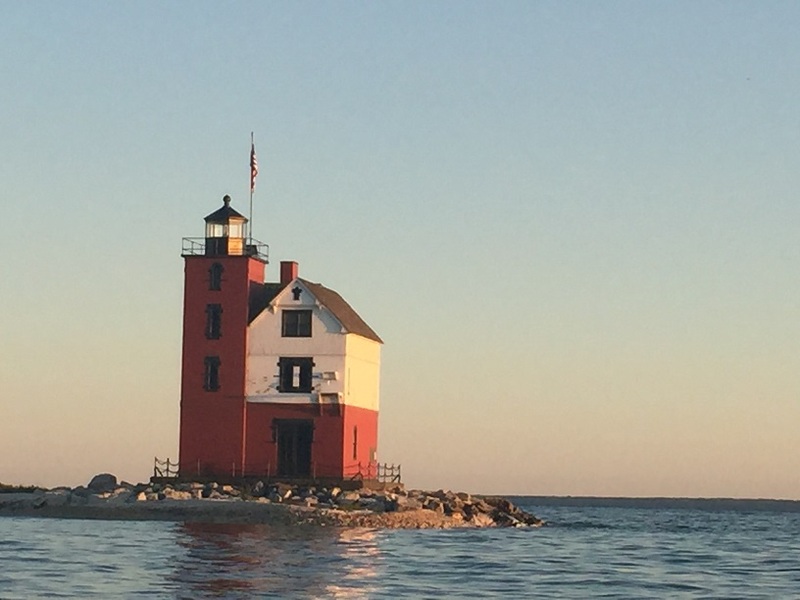 Lighthouse across from Mackinac Island, on Round island. 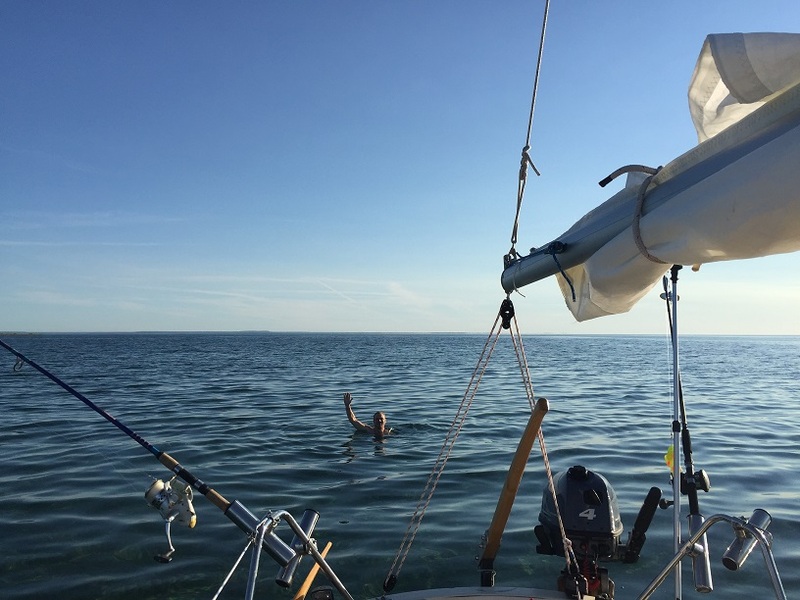 After a nice nights sleep under bright starts, we awoke and took a dip before heading out towards Les Cheneaux Islands. 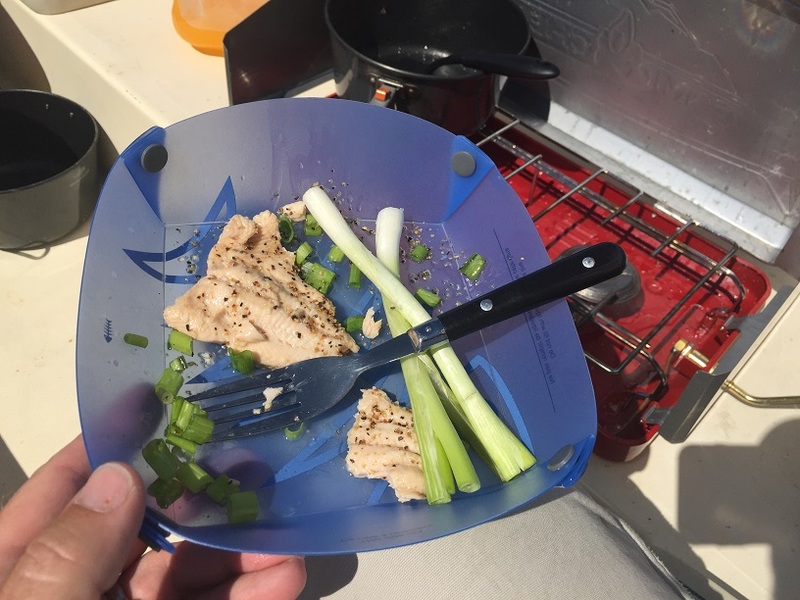 .....and promptly filleted and fried in on board. 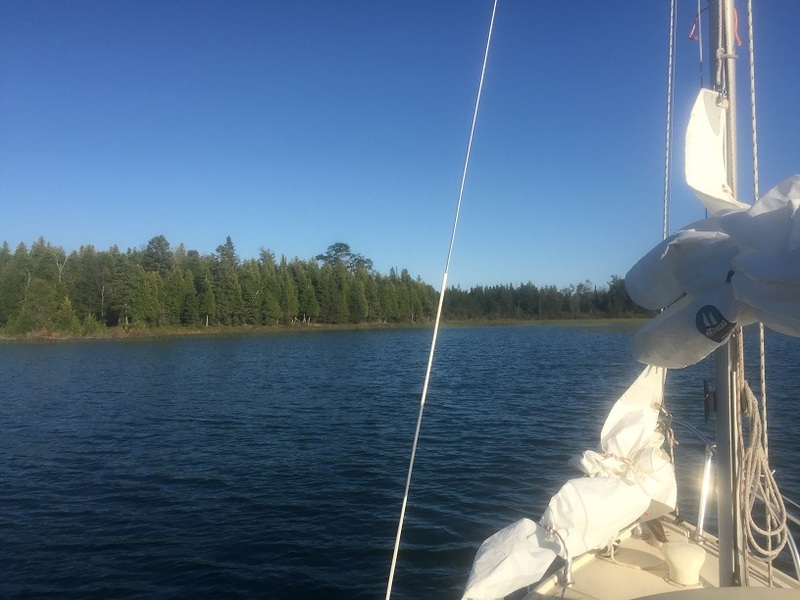 We experienced the doldrums for about an hour, halfway across on our way to Les Cheneaux, and then the wind shifted and came nearly from the direction we needed to head. We beat into this for three hours. 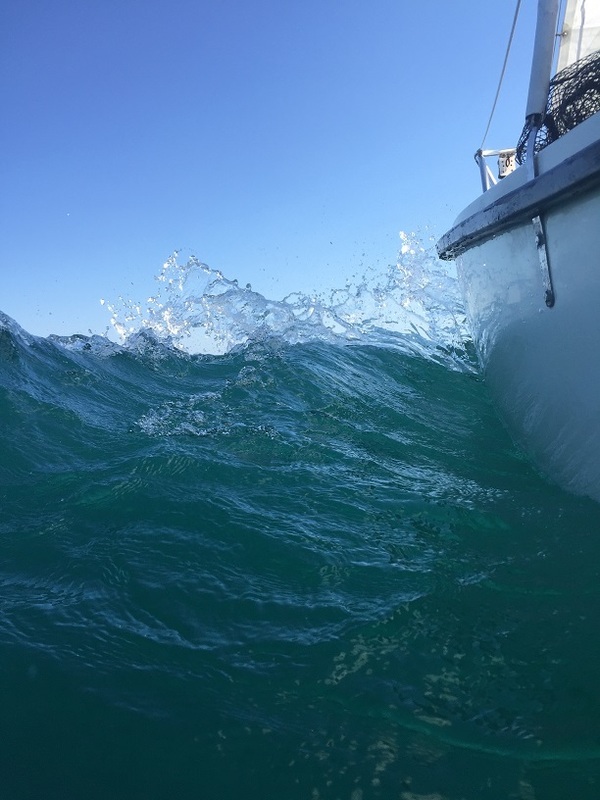 This was a good opportunity to get some cool photos of the bow of the Compac 16 breaking into the waves (Iphone almost wound up in the lake...). 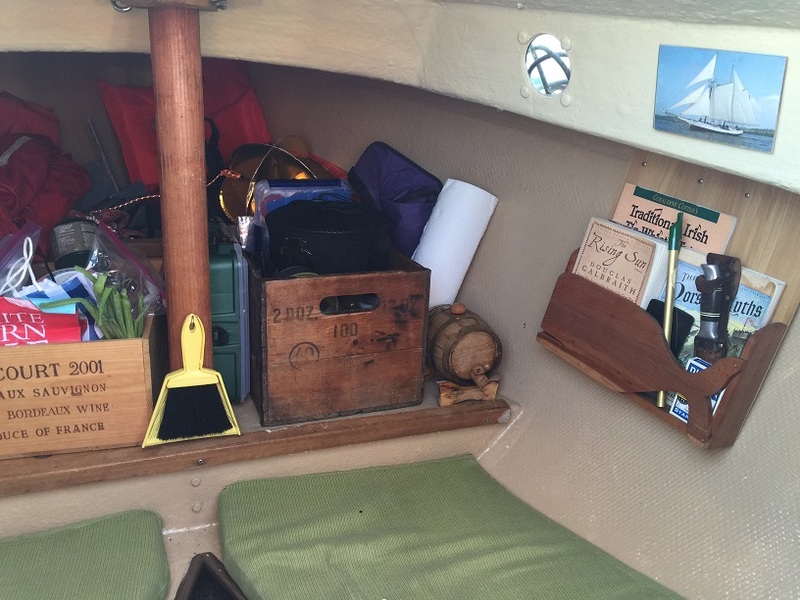 ​On a small ship there must be a place for everything and everything must be in it's place. Les Cheneaux Islands are a very unique group of islands along the north shore of Lake Huron. They are separated by small channels with a few large bays. 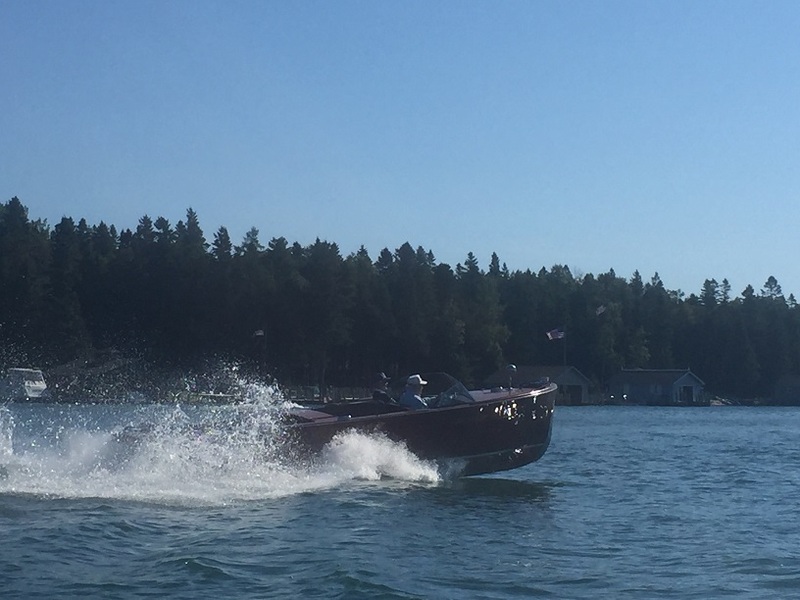 One feels more like they are on an "up north" inland lake, then on Lake Huron. 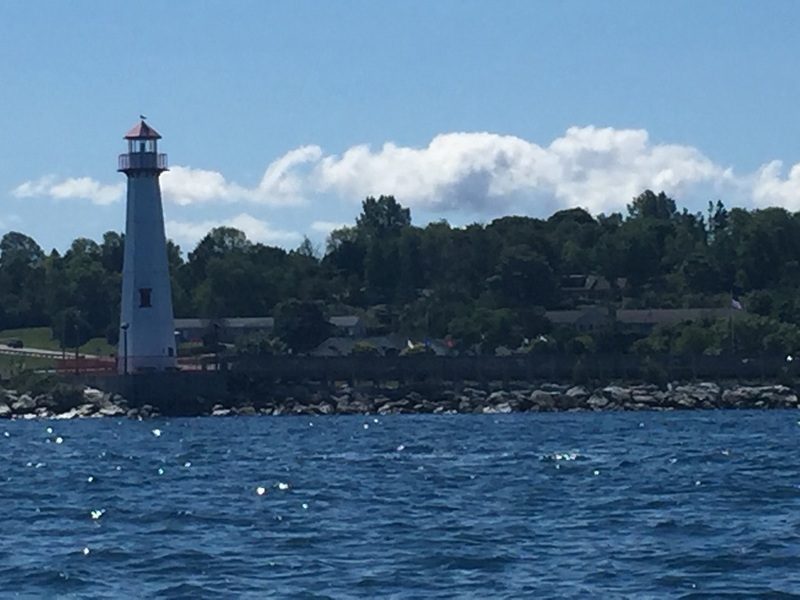 Upon entering the islands we noticed that they were more developed than we thought, with many homes and piers; and many of those very affluent and large. 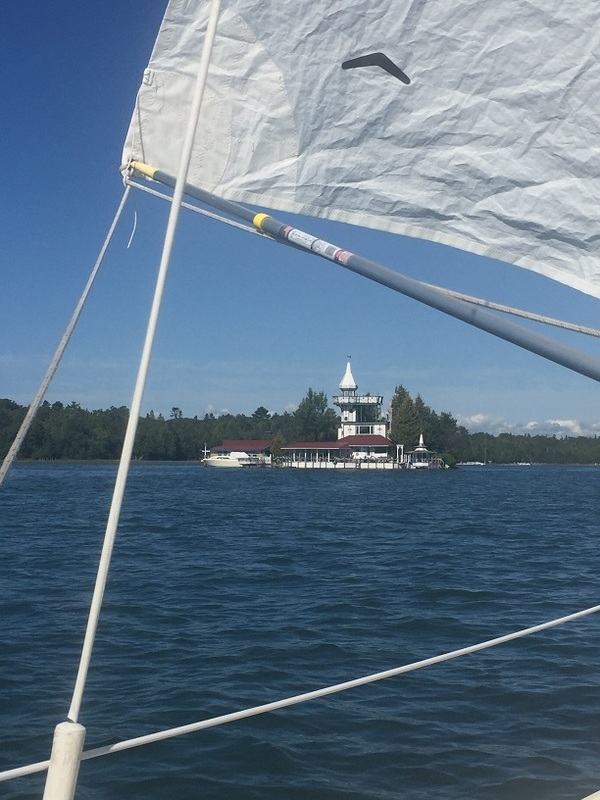 We found a quiet anchorage in a bay on the northwest corner of Little Lasalle Island. 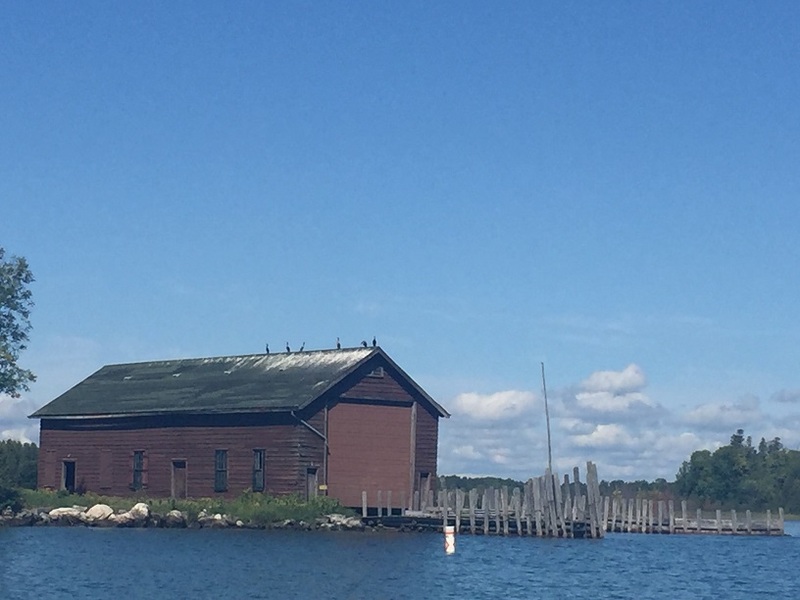 ​We sailed northeast through the channel with Marquette island to the west of us, and towards the town of Hessel. We then turned south to head back out into the lake. 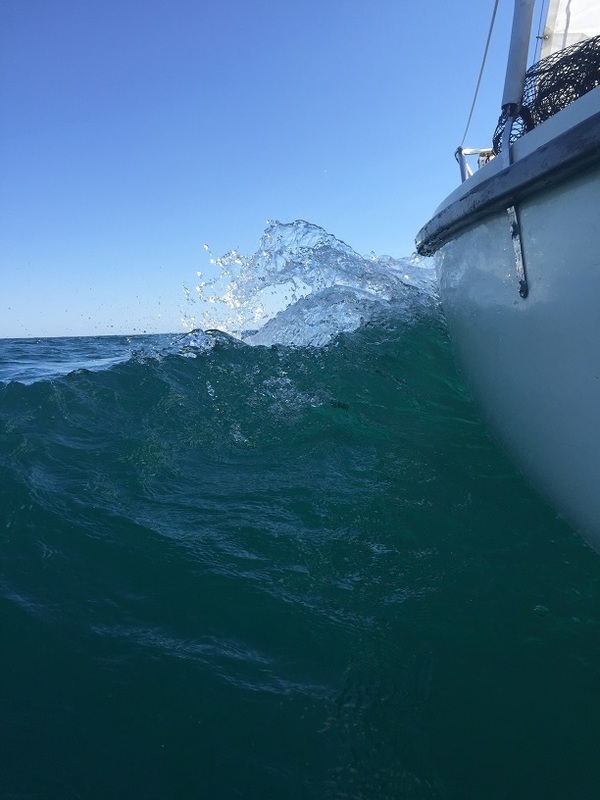 The wind dropped to 1-2kts from the south and after an hour of tacking back and forth and more or less going straight east and west instead of south, we gave up the ghost and used the iron wind to get out into the wind and into the body of Lake Huron. We then had a beautiful rolling reach eastward to the St.Martin Islands where we swam ashore, explored a bit, and snorkeled some protected shallow waters. 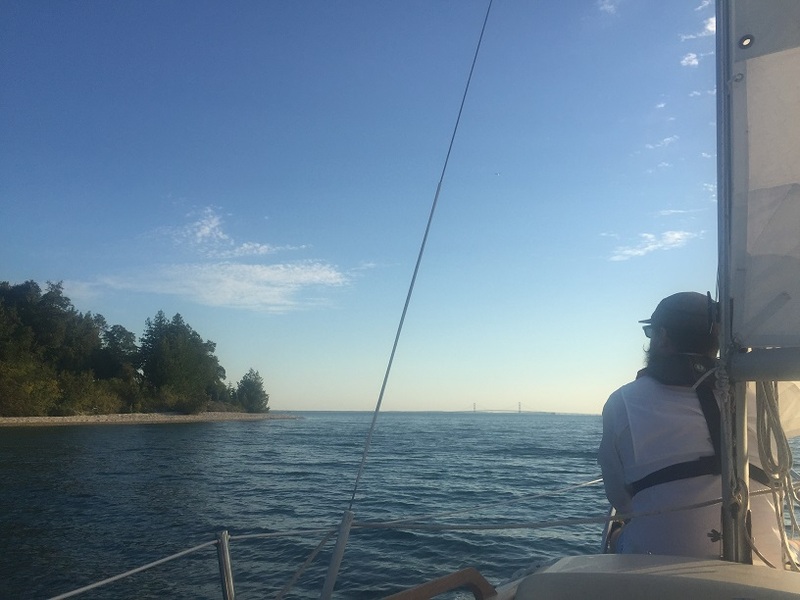 Sailing to Mackinac Island, the bridge in the far distance. 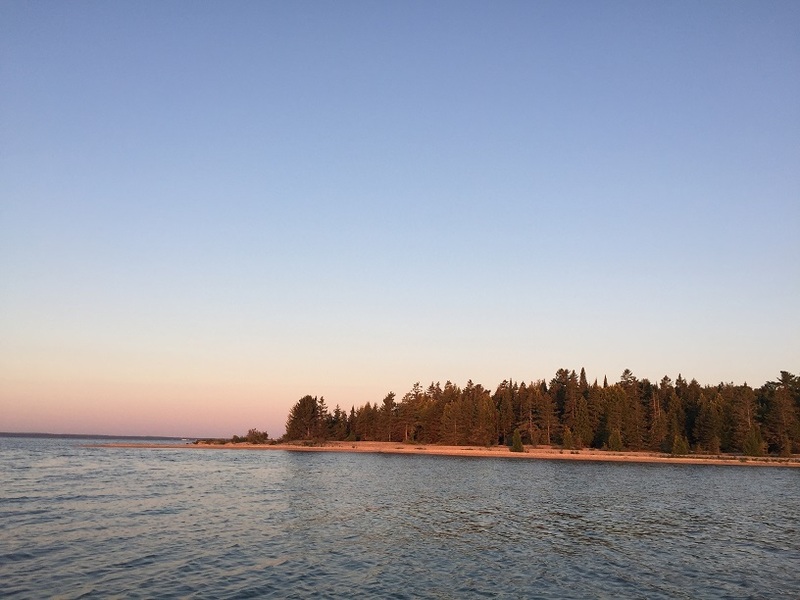 The northwest of Mackinac Island is wooded and not very developed, at least as can be seen from shore. There is a nice gravel beach, and the water drops off steeply off shore. 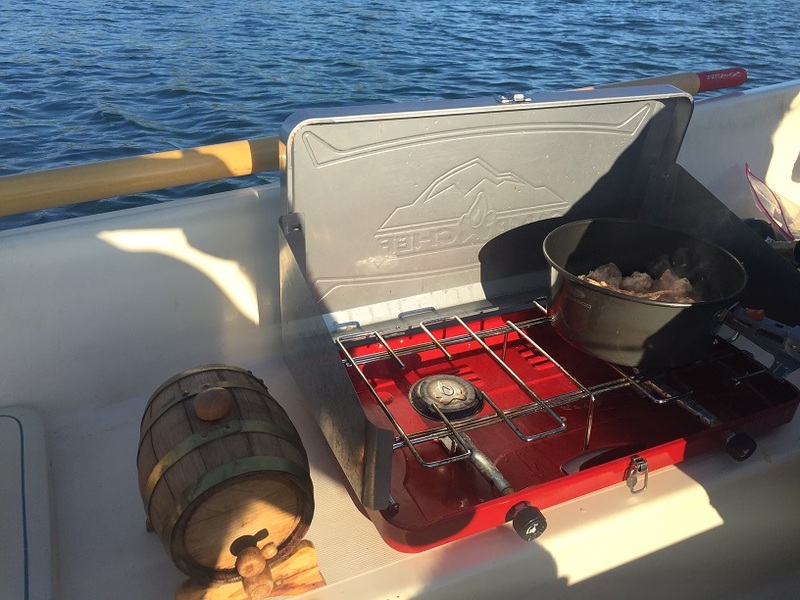 There is no harbor, but with a southeast, light wind forcast overnight, we anchored here. 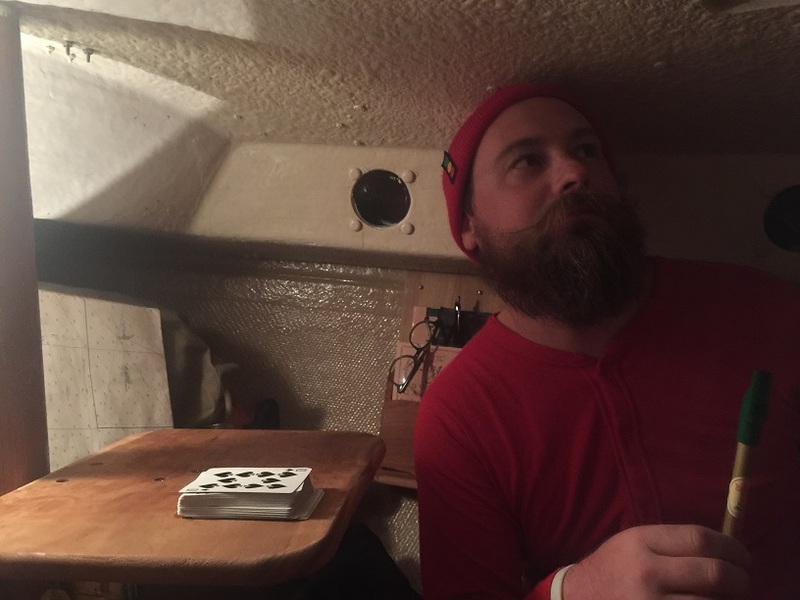 My brother Justin in the cozy cabin of the Compac 16. 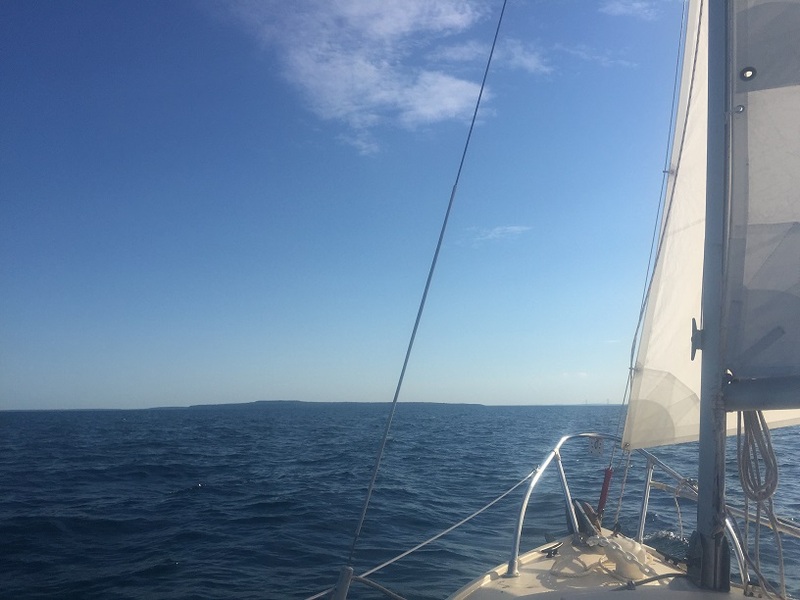 After another nice swim and evening, we awoke the next morning to a perfect wind from the southeast, and used it to sail across the channel to St.Ignace. 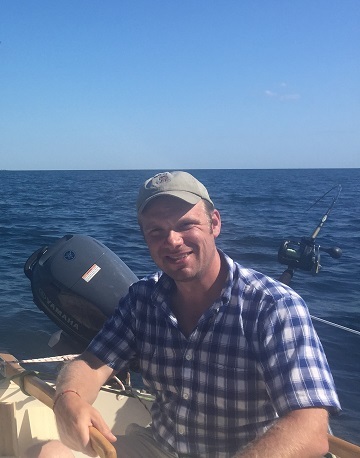 Approaching St.Igance, by brother before the mast. 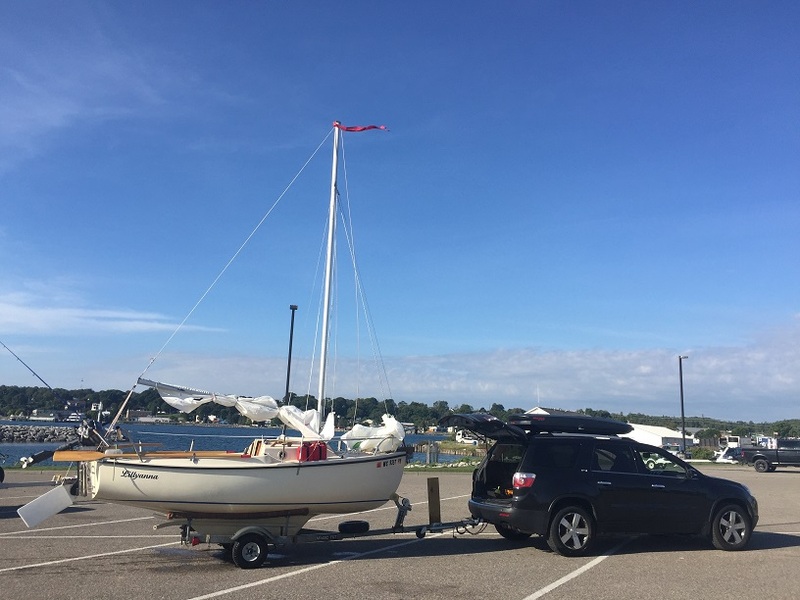 We had a very satisfying approach to the dock, in which we executed a jibe to come around a breakwall, beat up wind towards the dock, beared to port toward the dock, dropped the mainsail to slow down, ran towards the dock under the jib alone, dropped the jib to slow down more, and then gently slid up to the dock on our port side. Fantastic. A lucky and wonderful trip all around, and we enjoyed everything we saw and experienced. As always, the best part was spending time with my brother. 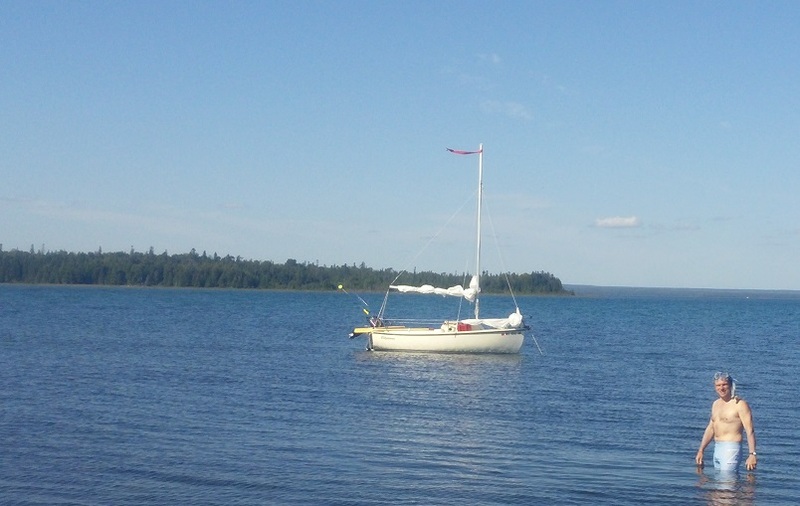 Lillyanna retrieved from the St.Ignace public launch.